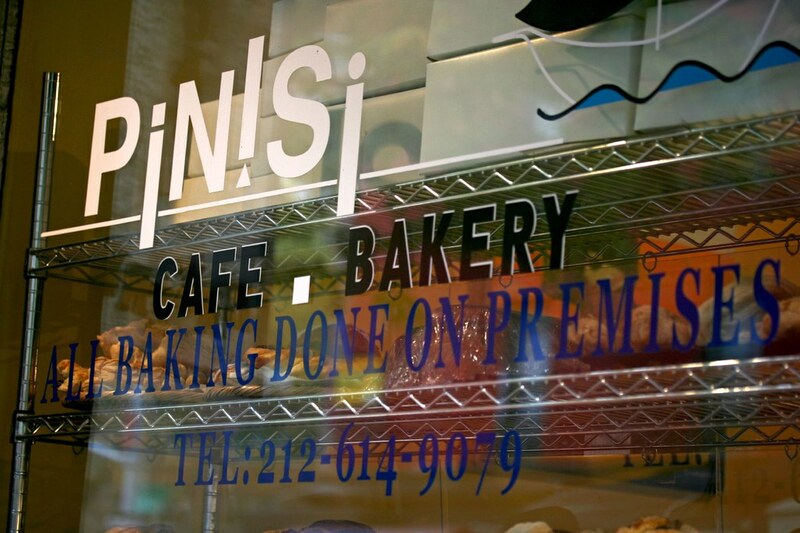 Anyways, I finally went to Pinisi and find out what the heck she’s raving about. 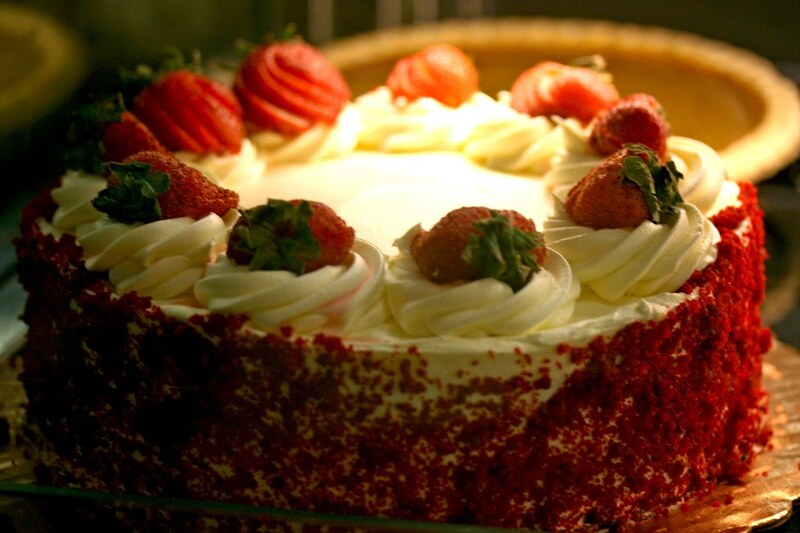 After stepping in this tiny bakery, I was greeted with pretty cakes and desserts. Ok, enough with that. After taking those photos, I wanted to eat something. 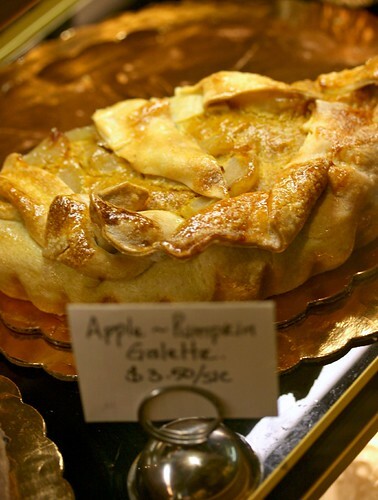 As I perused the pastry case, I became indecisive. A lot of their stuff just looks too good to pass up. 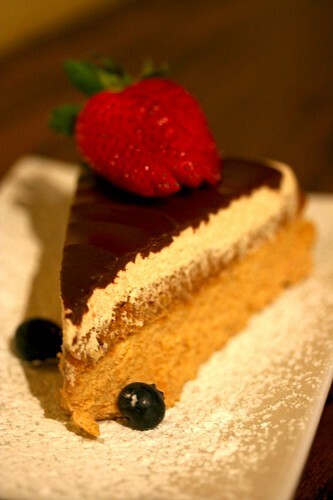 Eventually, I settled for a slice of chocolate-pumpkin cheesecake. 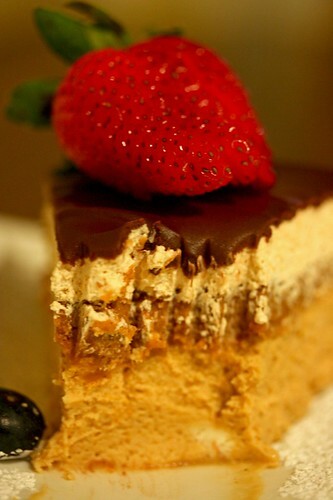 Whenever I have or make cheesecake, it tends to be the typical NY cheesecake, as in a decadent, dense, heavy, creamy dairy based dessert. When it comes to Pinisi’s it’s surprisingly light. 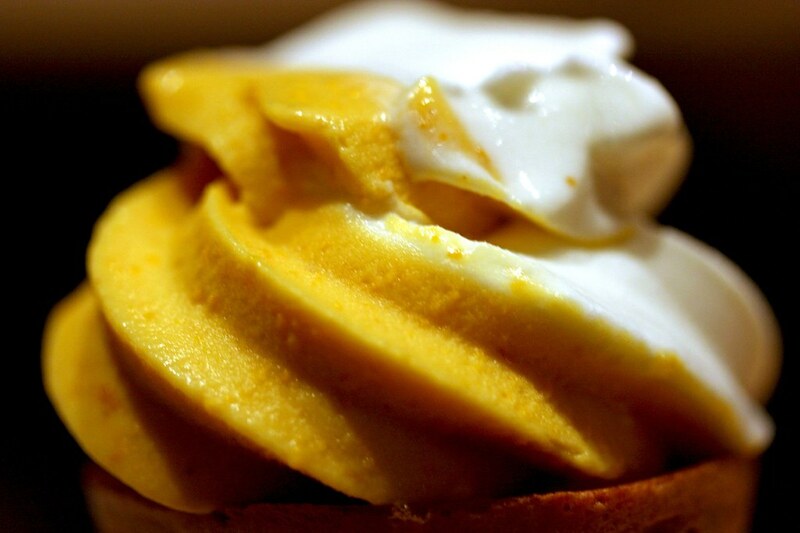 It’s whipped enough that it’s almost mousse-like in texture with enough pumpkin flavor and it’s not dominated with too many spices. Very delicious. But after finishing and walk out 5 minutes later, I felt like I ate a brick. I guess that always happens whenever I eat cheesecake. Since I was walking up on First Avenue, I nearly passed by Momofuku Noodle Bar. 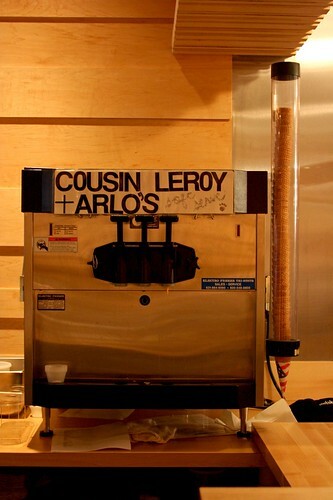 I remember reading and saw a few photos of about their newly renovated space and their dessert, the soft serve ice cream that has brownie bits in the bottom of the cone. Since I was in the neighborhood and don’t go here that often, I thought to myself, “Let’s eat here!” Despite the fact I felt kind of full from that cheesecake. I ended up ordering the roasted brussels sprouts, fried sweetbreads, spicy tripe, along with every intention to eat that soft serve. 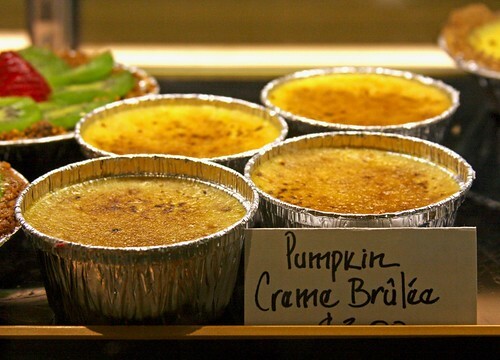 Add those items with that big slice of pumpkin cheesecake I had half an hour ago, it’s a lot of freakin’ food. 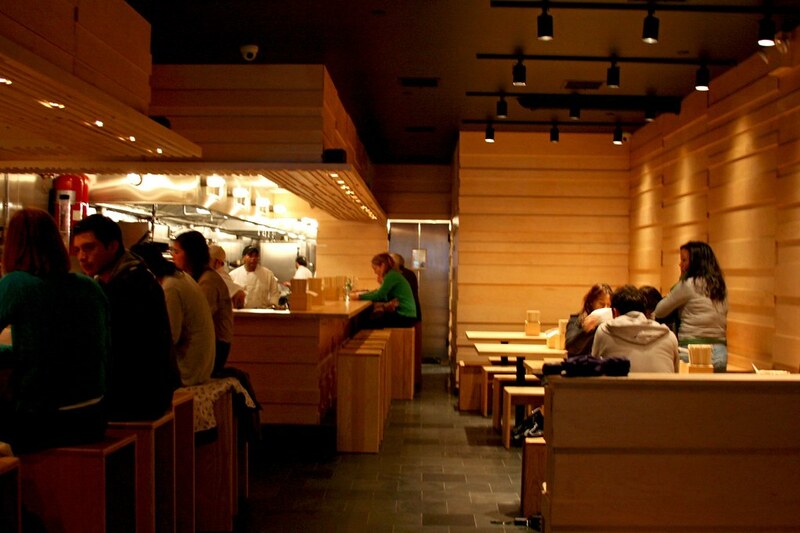 Somehow the veggies at Momofuku Ssam or Noodle Bar are amazing. 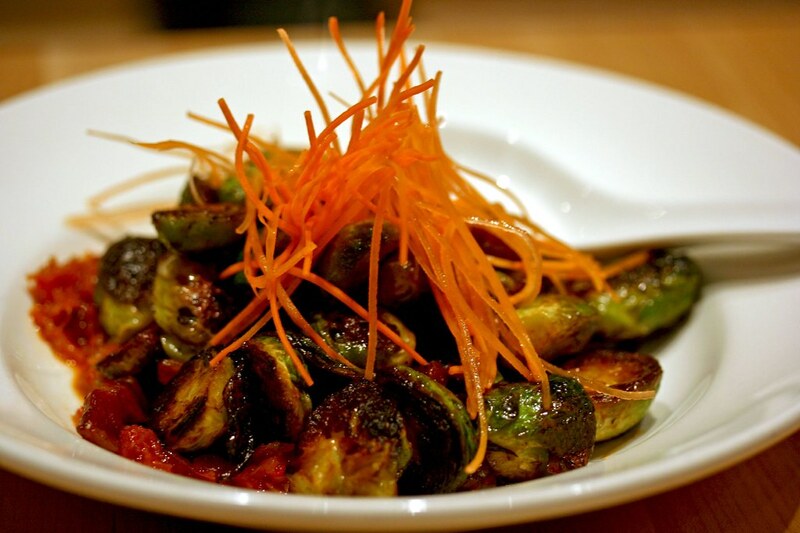 It must be the pork or magical food powder that makes their roughage really yummy… Anyways, the sprouts were roasted to perfection, slightly crisp on the outside and soft and chewy on the inside. 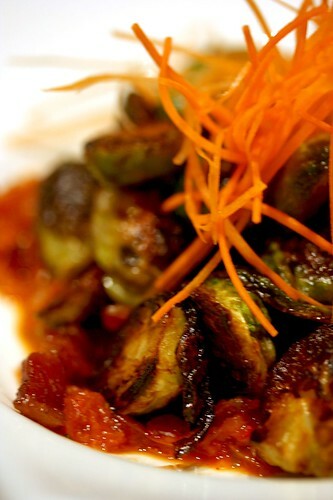 The kimchi that’s sitting under the them gave the brussels sprouts a nice sweet, slightly tart, and spicy kick. What’s also good about it is the addition of bacon. Bacon makes everything taste better, no? It’s also quite a generous portion I thought it would be. The tripe was not what I thought it would be since it turned out to be a soup/stew-ish kind of dish. The murky, dark red hue to the soup was a warning to my brain and tastebuds that this should a scorcher. And it was one spicy dish. 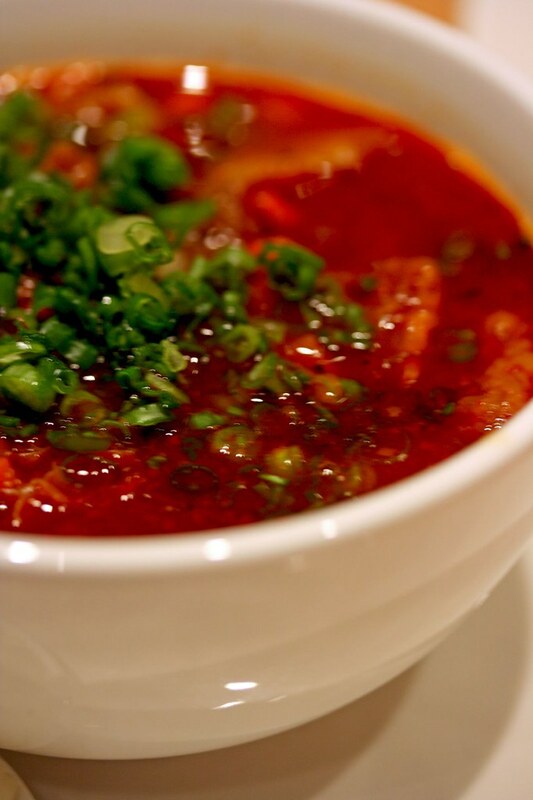 The soup base tasted like it’s tomato based with the addition of hot chili peppers, finely diced carrots, scallions, and onions (as you see on the earlier photo), and small chunks of silky, chewy honeycomb tripe. It’s initially sweet but then the burn slowly builds up in the back of my throat as I kept eating it…’til I started to cough. Oy. After eating a small portion of it, I just kept it aside and told the server to wrap it up. It’s very tasty but I want to save my humiliation of having my throat burned at home. Soon after, my sweetbreads arrived. Once again, the portion size surprised me. It’s basically a soup bowl’s (a little bigger than that) size filled with fried veal sweetbreads. At this point, my stomach’s already telling me, “I’m full.” But I’m ignoring it and ate these lovely fried nuggets of veal thymus glands. These are appealing to eat since they kind of like eating popcorn chicken; it’s quite addictive until you’ve reached to the bottom of the bowl. They’re fried until its crisp on the outside and the inside still have the juicy innards. 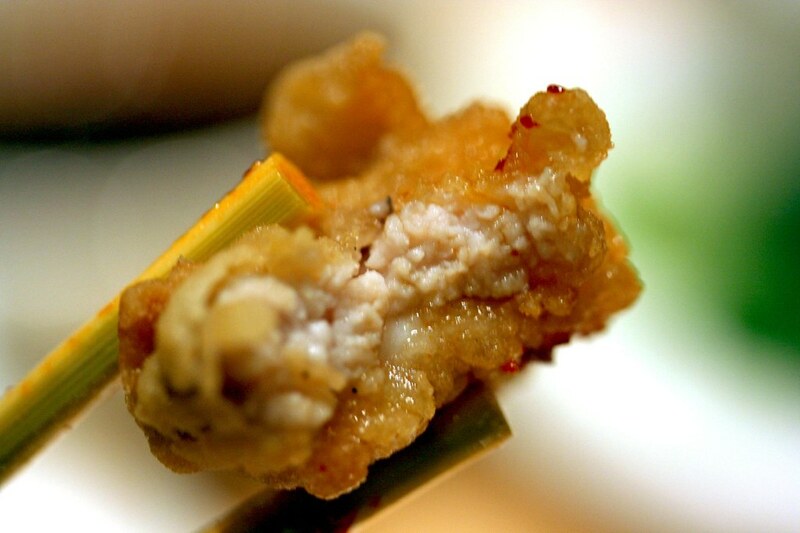 Mmmm…I love sweetbreads. 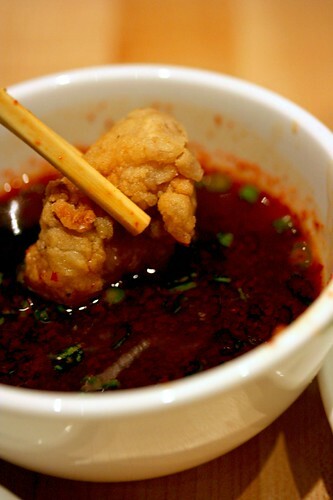 The dipping sauce that accompanies the sweetbreads is actually sweet and slightly spicy. 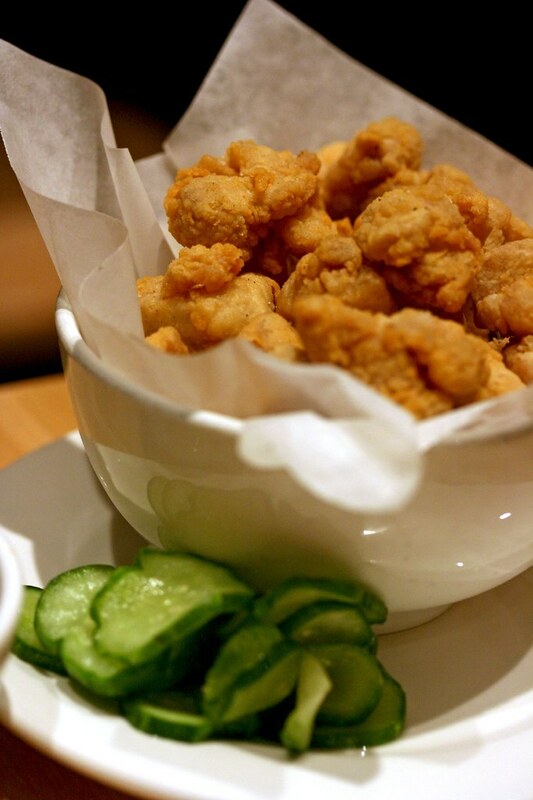 It really goes well with the salty, meaty sweetbreads. 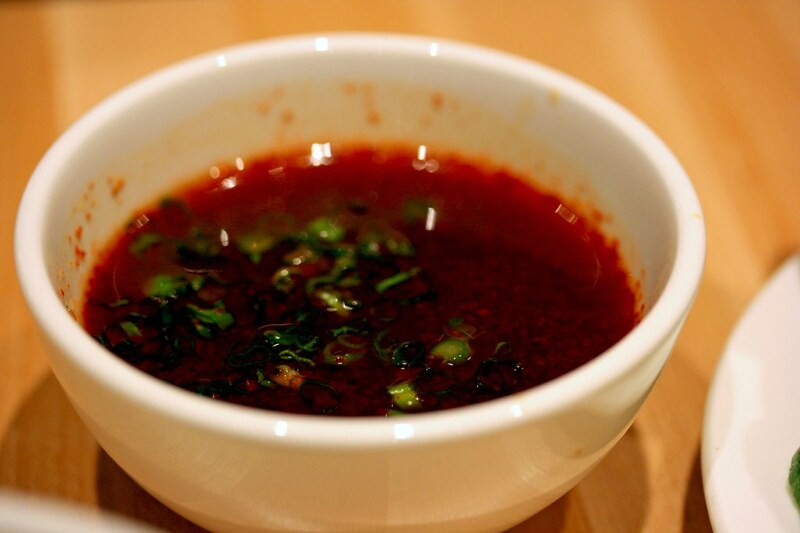 The sauce is very tasty that I would imagine it being mixed in with some rice or something. The pickles on the side are actually pickled for short amount of time since it tastes like cucumbers with a hint of salty-sour flavor. It’s a refreshing contrast to the sweetbreads. After eating all of those dishes (except for the tripe), my stomach’s waving the white flag and shooting electrical impulses to my brain screaming, “I’M REALLY FULL! !” My server came back to my table, clearing it up, asked me, “Do you want your soft serve yet?” I told her, “Uh, not yet. I’m really full.” Thankfully, she understood and she told me to take my time and let me linger around for a bit for digesting all the food I ate. 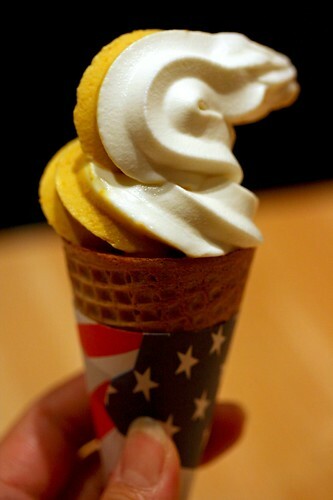 Within time, I got my soft serve. Originally, I thought the ice cream flavors would be sweet Cream and espresso with brownie crumbles since I’ve read that a few weeks prior to my visit. 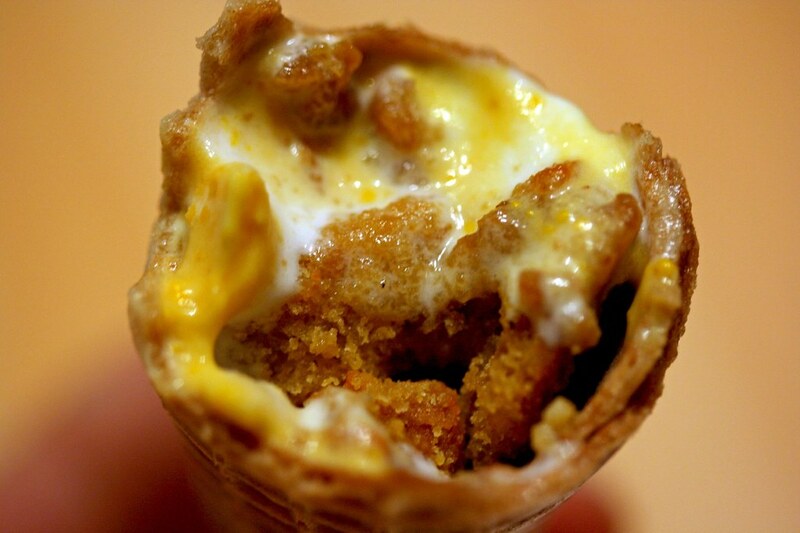 But it’s actually pumpkin and cream cheese with carrot cake crumbles. I kind of wanted chocolate but since it is fall and I do like pumpkin, I don’t mind having it. The pumpkin side had enough pumpkin flavor with nutmeg and a touch of cinnamon. The cream cheese was tart and mild. Neither flavors are too sweet and the flavors compliment each other well. As I’ve eaten about a little more than halfway, the crumbles are actually there. I thought the crumbles would be something like cookie bits kind of crunchy. I don’t know what made me had that presumption but it’s more like crunchy on the top layer, if you will, then as I progressed on eating my way down, it became more softer and cake-like. Taste-wise, it does taste like carrot cake: spiced with cinnamon, nutmeg, and allspice. 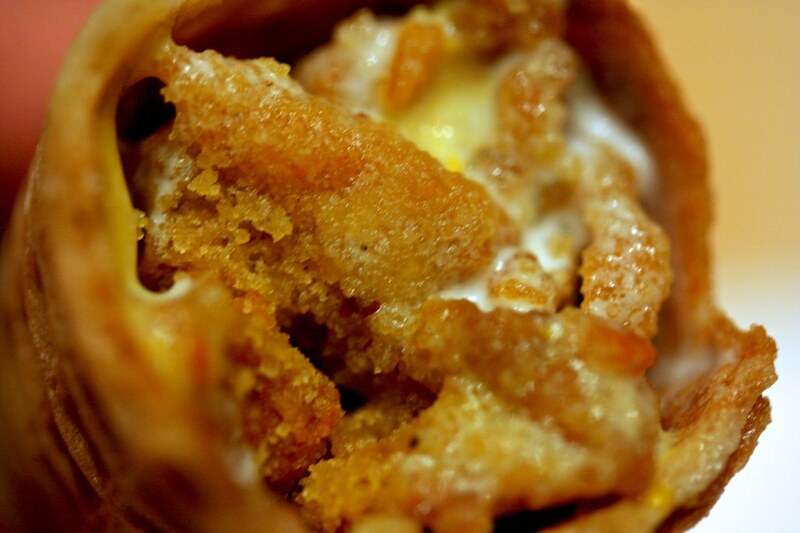 Even just looking at my macro shot of the crumbs, it does have tiny specks of carrot, too. Go figure. This was a good dessert but the price tag of $4 left me my wallet feeling a bit sore. This was a good meal nevertheless. Just next time I need to bring at least another person to share my food. Speaking of eating tons of food, Happy Thanksgiving everyone! oh that tripe looks perfect for a cold wintry day in the city! As for brussel sprouts, I’ve always hated them until I had it at a korean buffet where these mini-cabbages were roasted or grilled or whatevered to greasy perfection. Now I am a convert. oh boy, that was intense! Oh, I love sweetbreads. Frying it just makes it tastier and more worse for my health. 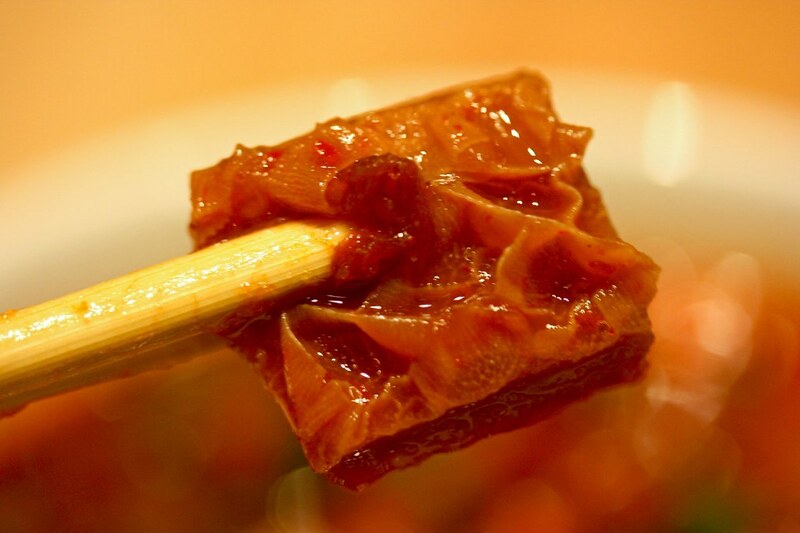 Dana: The tripe is a great winter dish! 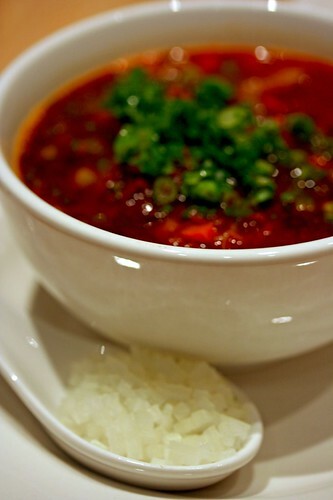 It’s hearty, spicy, and most importantly, delicious! In regards to the Ssam Bar vs. Noodle Bar, the Ssam Bar has more small dishes available during the night; the daytime it has a limited selection along with their ssam (which are wraps). 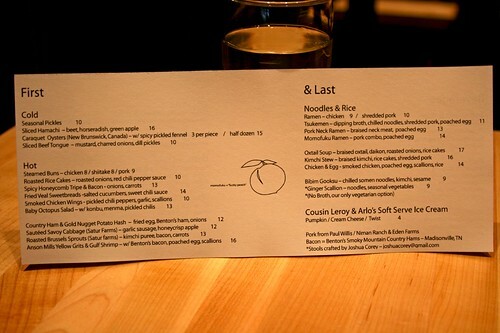 The Noodle Bar has more selections during the day, as for the soft serve is only at this place. 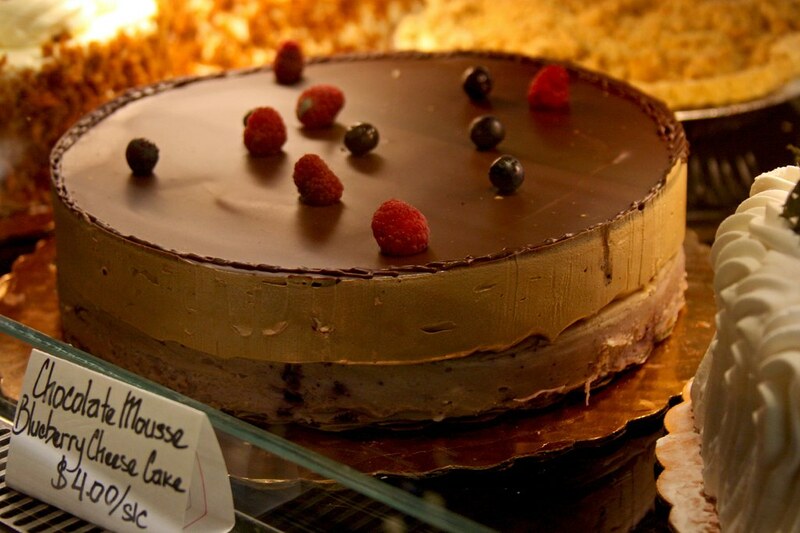 But both places are very good, just some have their strengths and specialties of their own. Tea: It was intense fooding that day! I don’t know if I would do it again but I don’t exactly regret it either. every time i see those sweetbreads i wanna try them! Danny: Go and get ’em!